JMD 1.1 (46K - includes source code) - What's new? What is the Java Message Digest utility? The Java Message Digest utility is an open-source file verification utility, supporting the MD5 (RFC 1321) message digest algorithm. How do I use the Java Message Digest utility? The Java Message Digest utility is written in pure Java, and thus requires no special installation. 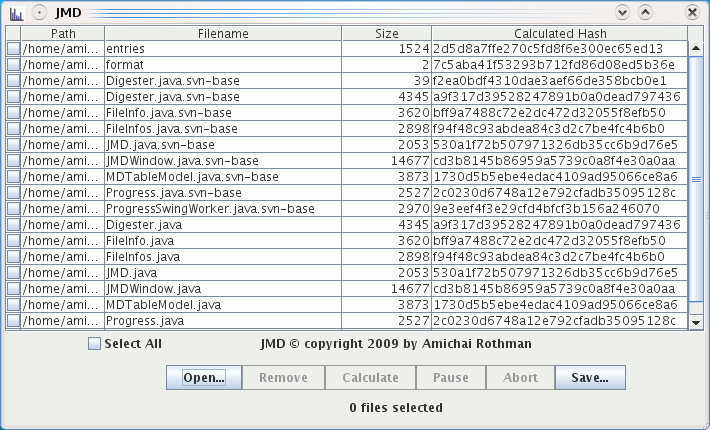 The provided jar file is executable, so you can run it using 'java -jar jmd.jar', or on some systems, just double-click the jar file. Fixed ignoring of files that are added more than once. Improved source code style and formatting. This is the first release of the Java Message Digest utility. The JMD utility is provided under the GNU General Public License agreement. Please write in with any bugs, suggestions, fixes, contributions, or just to drop a good word and let me know you've found JMD utility useful and you'd like it to keep being maintained.